This is the crater we hiked today. I thought it looked menacing. Do you? We decided to get up and out early so we could come back mid-afternoon, take a nap and then go out for dinner. Well, you know where you end up when you pave your road with good intentions…(No! We didn’t end up there!) We had a great day. We did get out “early for us” as in 10:00am. Each day we try to take a different route and drive on roads we haven’t driven, just to see what surprises greet us along the way. Today, we missed the turn, so we ended up doing our itinerary a bit backwards or roundabout! 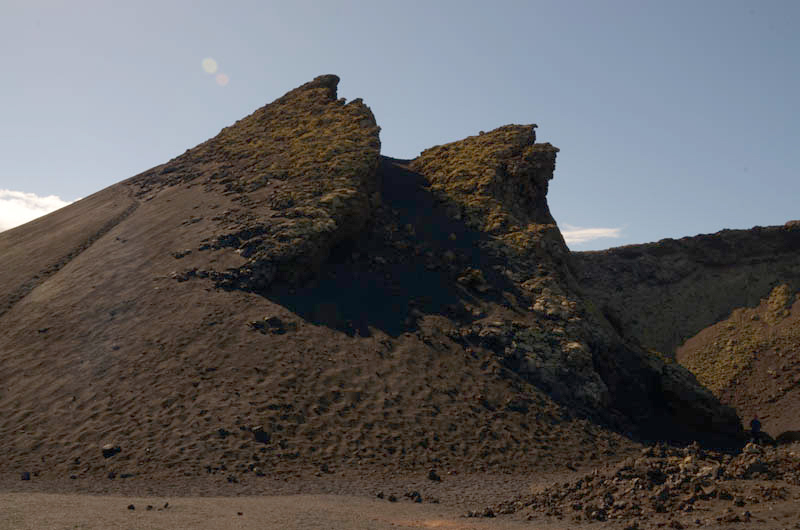 Our first stop was a hike to see the crater of the volcano that was responsible for the most reent eruption (1824). We have driven by it several times already. It isn’t particularly big (like the caldera blanca) but it is wicked looking. Very jagged and imposing. Dark, too. We parked along the side of the road, and for this hike, we had lots of company. Many other couples were already on the trail or pulled up just as we did. This was not a strenuous hike – more like a walk that anyone could do, and everyone would be recommended to do so! The path is excellent, extremely easy to follow and easy to walk on. The walk isn’t far, before you know it, you’re at the base of the cone. The path winds around the cone to the collapsed section, and then you climb up a short way and you’re in. I don’t think I can adequately describe to you what you see: the rocks around you are jagged and scary looking or they resemble melted plastic. 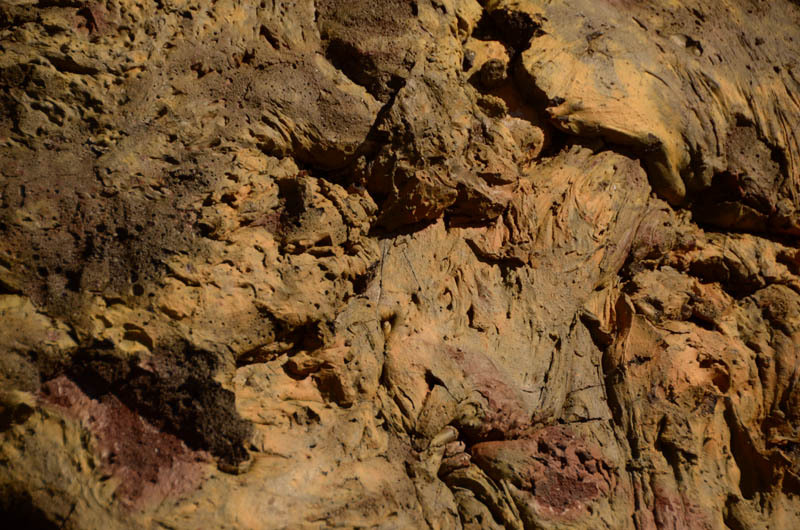 It is almost unearthly to consider how hot those rocks have to get to actually turn into liquid, and how fast they cool, to make the forms and colors they do. This is menacing for sure! This is where the eruption blew out the side of the crater making a convenient entrance for us. You can just see the silhouette of a person entering at the lower right. 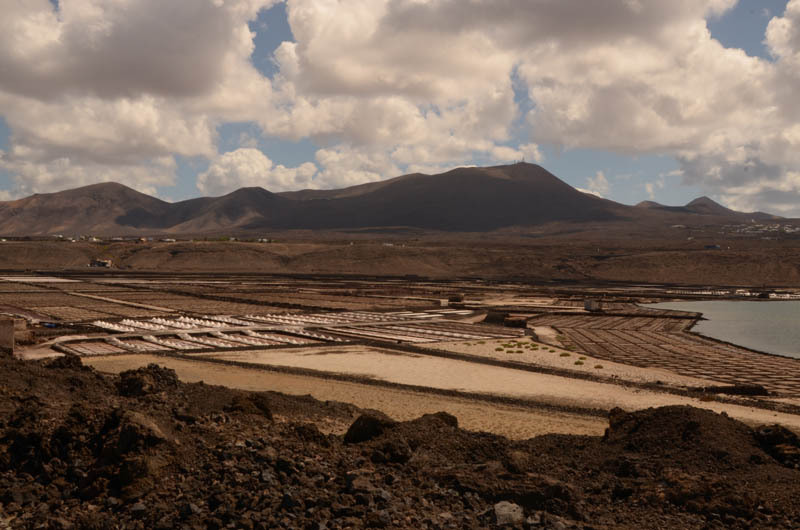 After that walk, we drove to the Atlantic coast again, to a new area, this time to see the salinas del Janubio. A salina is a place that harvests salt from the sea. This one is just one of 2 that remain in production on the island. Salt used to be important when fishing was a major industry here – salt being used to preserve the fish. Now fishing is not important, and so salt production is also much less important. We left the car in the parking lot for the Janubio Beach, where we saw for the firt time on this trip (but not the last time even today) a sign warning you not to swim. The surf was exceedingly rough. 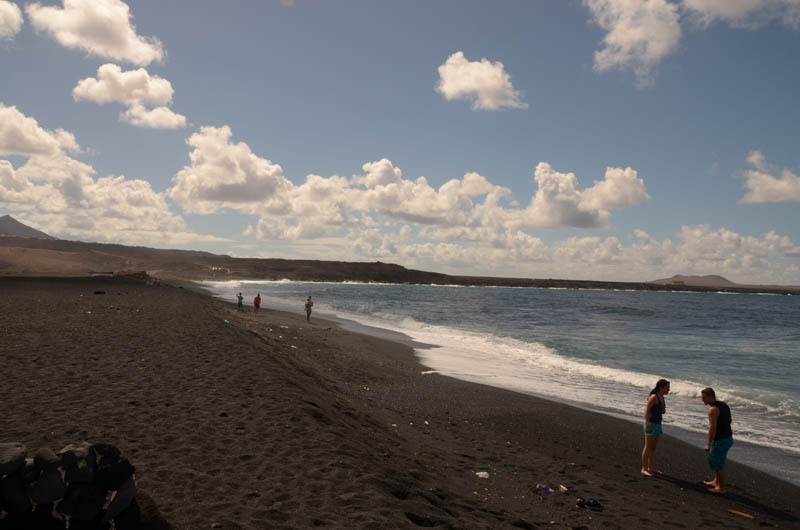 The black sand beach at el Janubio. We walked around the lagoon that hosted saltpans on three of its four sides. A good portion of the areas we were walking through were abandoned. 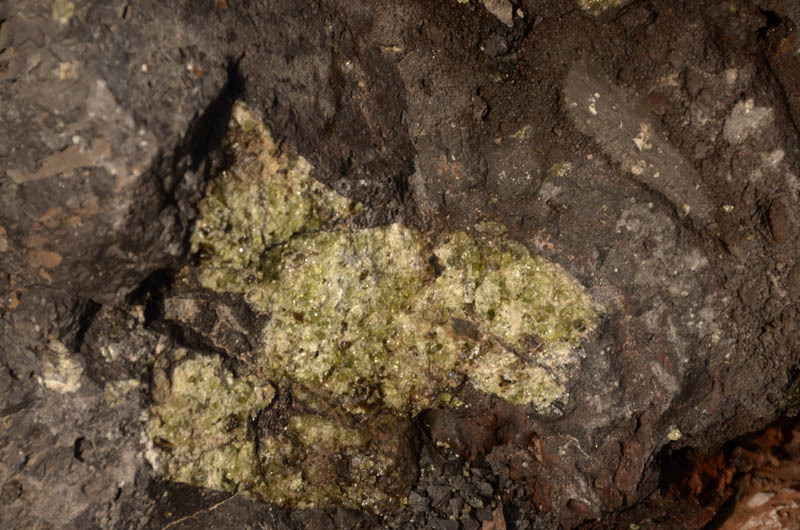 There was still evidence of salt forming, but the lost and forgotten aspect of the place could not be denied. We walked a good way around the lagoon to areas where salt was being produced, still guarded over by derelict buildings. It was all quite interesting. We did not see the red salt pans until we were back on the highway and looking down on the salina. The red color is due to an organism that feeds on an alga within the salty seawater…I think all the color disappears when the orgaism has eaten all the alga and then dies off. From Janubio, we headed north along the coast to see los hervideros. Hervir is to boil in Spanish, so you can get a mental picture of what is in store. 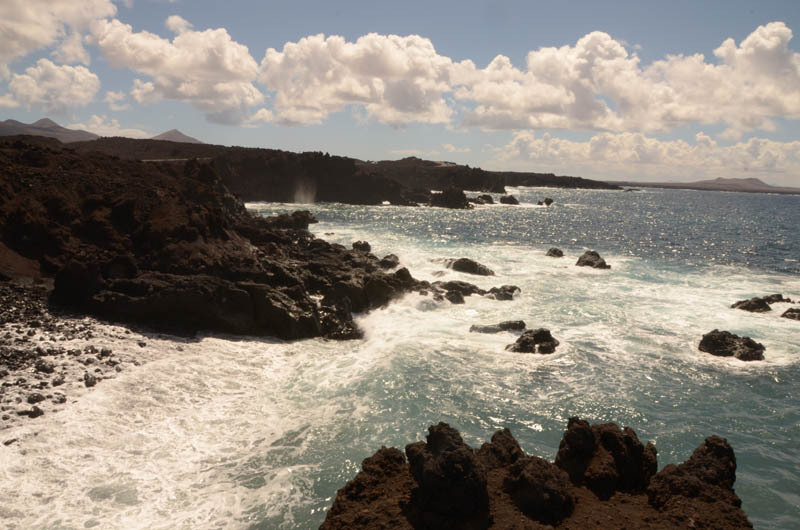 The surf is rough, the cliffs are jagged and steep…the water looks like it is boiling as breaks over the rocks and crashes into the cliffs. However, los herideros are actually something quite specific. These are areas where the water has carved tunnels into the lava cliffs. The water races in and then splashes high and loud as it moves around in the new space. It is really something to watch. This entire coast will be my favorite thing of this trip. 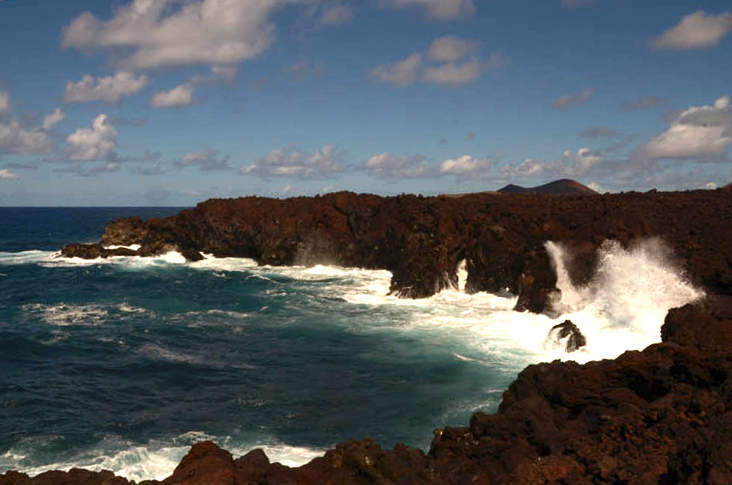 We’re hungry now – it is almost 2:00pm – so we drove to el Golfo, another little coastal town in this region. We sat in a restaurant along the beach, watched the breakers and ate a hearty lunch of grilled local fish. It was delicious, and just the thing for this day at the sea. The “boiling” water near the Hervideros. 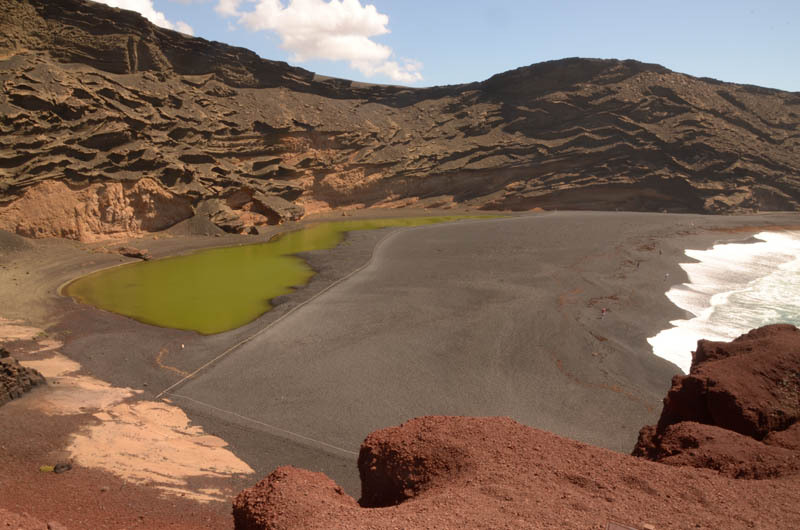 El Golfo is the stopping off point to see el Lago de los Clicos (don’t ask me what clicos are – I asked Gerry and he didn’t know either!) However, this “lake” is actually a lagoon filled with an alga that turns the water an unreal shade of green (think chartreuse). You can’t get too close to it – I am sure that has something to do with “delicate ecological balances”, but it is strange and wonderful to behold! 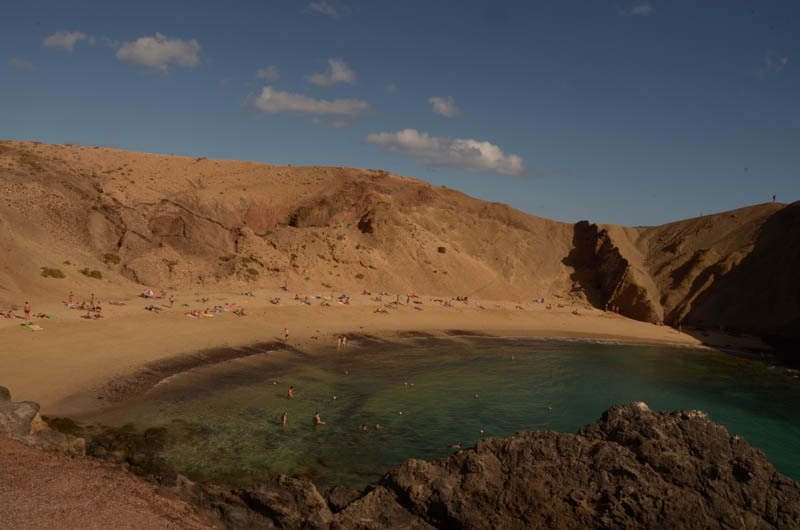 This is the Lago de los Clicos – I tried to show it to you in its setting – just back from the beach. It is really quite large. Next, we have one of those “Yes. No.Yes. No.” times deciding whether to drive down to the southeasternmost corner of the island to see the “famed” beach called Papagallo. We were kind of tired, kind of sleepy after lunch. We were also already more than 3/4 of the way there and coming back tomorrow meant another long (although on an island this small nothing is very long) drive back this far. So we went. We drove toward Playa Blanca, another tourist development, then headed off on a dirt road (albeit with two lanes) toward the beaches. 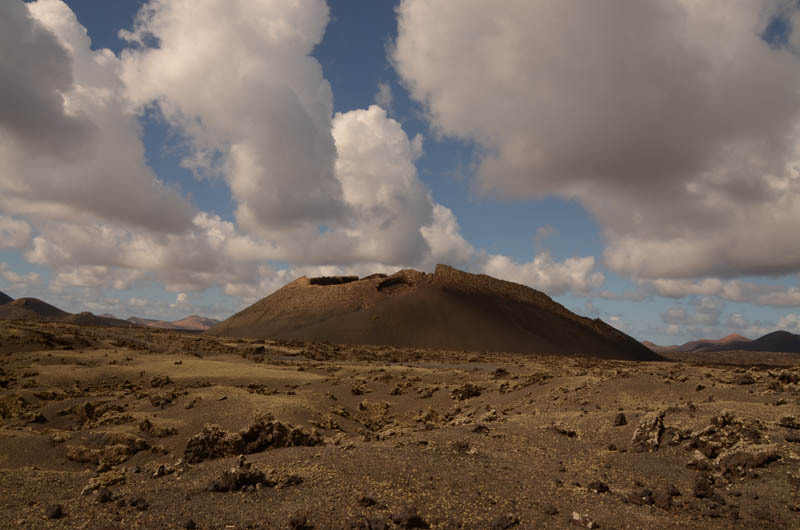 We had to enter another Parque Natural (this one called los Ajaches – another word we didn’t recognize but that has to do with land formations resulting from, I guess, volcanic activity). Gerry told me that he had read all sorts of criticisms of the 3 euro fee to enter the area, but despite that onerous fee there were plenty of cars entering and the parking lots at the beaches were full. There were two beaches accessible from the parking lot (area, really. it wasn’t actually a lot.) One was called “el Pozo” and it was a straight stretch of sand between two rocky cliffs that jutted out into the water. There was a gentle surf, and lots of people in the water. We were observing from the top of one of the cliffs. This is el Pozo Beach, with two other beaches beyond and way to the left you can see the white house of the town of Playa Blana. On the other side of our observation cliff was the Papagallo beach. It well deserves its reputation as one of the two best beaches on the island. This beach is semi-circular as the cliffs and rocks stretch out like arms and bend inward to create a protected cove. The water is crystal clear, with some waves, but no surf. There were lots of people sunning on the beach, but far fewer in the water than at el Pozo. It was a long walk down, so we opted to sit in a bar on the edge of the cliff, with a super cold caña (draft beer) and a view of the late afternoon beach scene. This is the Papagallo Beach. Would you agree it is a beautiful beach? After this long day of touring, we decided to forgo dinner out, and spent the evening on our balcony with a bottle of the Stratus wine and our now typical menu of ham, cheese and bread with salad. The moon is almost full. It was a wonderful end to a full day. Saturday, we stayed in the hotel. 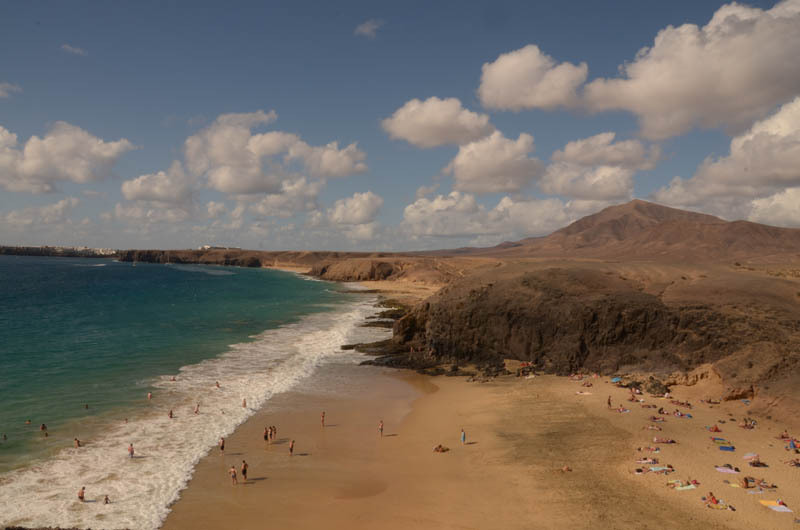 We have seen pretty much everything we wanted to see, and we knew from last year in Tenerife that we would regret not spending any time at all in the hotel, so today became a “duff day.” Actually, I spent a couple of hours on the blog, posting the first part of the Lanzarote trip. The writing part is fairly easy – but finding the right pictures to show you takes time and careful thought to say nothing of the technical challenges of working with the internet in the hotel (which I find so bad, that it makes me realize how spoiled I am to have great wi-fi all over my house and office!). Our food was delicious (risotto with mushrooms, veal cheeks and lamb) and our waiter quite garrulous and opinionated about the economic problems facing common Spanish citizens and wondering if it was any better where we live…he was the second waiter in as many days to ask us that.